The Computer Science and Computer Engineering (CSCE) Department at the University of Arkansas, the flagship campus in the University of Arkansas system, is building an excellent research enterprise while continuing to offer high quality undergraduate and graduate computer science and computer engineering education programs. The Department is very active in research and the average amount of new research awards per tenured and tenure-track faculty member is $191K for the fiscal year of 2015-2016. Our cluster of excellence in big data analytics has been significantly strengthened by four grants Dr. Xintao Wu received from the NSF and NIH. Dr. Matt Patitz recently has received a Faculty Early Career Development Program grant - known as a CAREER grant - from the National Science Foundation. Now, four of our 16 faculty members representing twenty-five percent of our faculty are NSF CAREER award recipients. 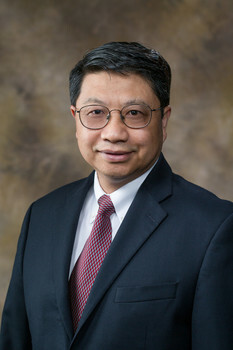 Dr. Jia Di led an effort to establish campus-wide interdisciplinary Arkansas Security Research and Education Institute (ASCENT) as its founding director. Our education programs are also growing rapidly to meet our state's and society's needs for talented professionals in computing technology in both hardware and software. In particular, our PhD programs are growing at a very fast pace and CSCE PhD student enrollment has increased form 19 in 2010 to 50 in 2016, representing an increase of one hundred and sixty-three percent. Each tenure-track faculty has now more than three PhD students on average. The growth of our PhD programs is supported by expanded sponsored research programs in the department. Our undergraduate student population has also increased significantly and our undergraduate enrollment in Fall 2016, excluding freshman students, is 452. Thanks to a nearly $1 million grant from the National Science Foundation for a project led by CSCE faculty Dr. Dale Thompson, 20 high school teachers in the state of Arkansas were trained to teach a course AP Computer Science Principles in the summer of 2016. This course is designed to engage high school students in computer science - one of top priorities for Arkansas Gov. Asa Hutchinson. Arkansas became the first state to mandate computer science education in high schools after Hutchinson signed Act 187 into law. our department also successfully hosted an annual University of Arkansas High School Programming Contest, sponsored by Acxiom and the student chapter of ACM in the University of Arkansas, on March 12, 2016. Around 140 students from 17 schools throughout the state of Arkansas attended. In summary, CSCE has made significant progress for the past year in all areas of research, education program, and outreach as a result of the hard work of our faculty, staff, and students and support of our alumni. We are confident that CSCE has a bright future by working together.